Here is my second week participating on MPM, although I don't even know how I'll make it through the week. Its just too hot to cook!! My air conditioner is working overtime!! I'm going to continue to try to keep our meals well balanced & healthy, but since I still need to make a trip to the grocery store...our meal for today isn't really diet friendly, but it is good!! This is it for now....its really hard coming up with a menu for the week. Now to get my shopping list together & off to the supermarket I go. 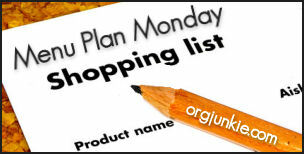 If you'd like to join in on Menu Plan Monday, visit I'm an Organizing Junkie. :) Have a great week everyone!! Vacation: To Stay or Go Away???? Workout Complete for Day 2! Day 1 - Let's Start it Up!! My Weight Loss Plans continue.....with a twist! Good Times on the 4th! !